Starts to relieve cravings in just 30 seconds to help you quit smoking for good. Acts fast on nicotine cravings to help smokers quit. Suitable for all smokers regardless of the number of cigarettes they smoke. To help you quit smoking for good. 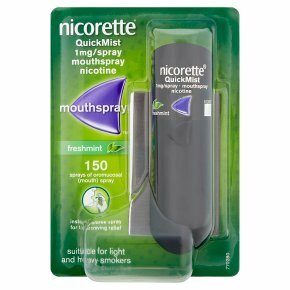 Use: Nicorette® QuickMist is used to relieve and/or prevent withdrawal symptoms and reduce the cravings you get when you try to stop smoking or when cutting down the number of cigarettes you smoke. It provides a safer alternative to smoking for both the individual and those around them. Ideally you should aim to stop smoking. However it can be used in a number of different ways, either to completely replace all your cigarettes, or if you do not feel ready to stop smoking completely, to replace certain cigarettes and therefore help you to cut down the number of cigarettes you smoke. It may also help increase your motivation to quit.